Is it me but I hate to see all the 'Bake off' type TV programmes where the bearded men do not wear beard nets. Surely this is an essential H&S matter. Luckily I don't watch the programmes. 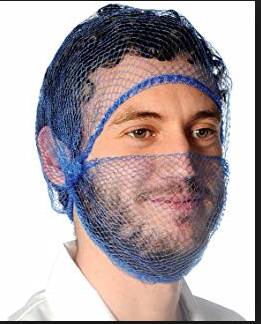 I've never heard of a beard net. I've just finished my food hygiene training and beards weren't mentioned. I heard them referred to as ' beard snoods' the other day ! I'll have to tell husband about beard nets. He has a very bushy beard which sometimes traps food. He says, "I'm keeping it for later!" But maybe it's more important for chefs etc, who are preparing food for others. More concerned by Nigella flowing locks! DH has a beard and as a far as I know I have not had any beard-related infections from him. Never heard of a beard net either, but of course it depends on the beard, short and neat or a full Father Christmas. Anyone who prepares food for a living should not have any sort of hair ‘loose’. Mustaches used to be called soup strainers, perhaps a beard should have it’s own name too? A beard you could lose a badger in wouldn’t be ideal for a chef.Clean shaven only! Well need to keep mine tucked out of the way then! I hate watching 'chefs' with either flowing locks, beards, jewelry especially bracelets and rings, nail polish, outdoor clothes and tea towels thrown over shoulders. I am a retired chef and a friend is an environmental health officer here specialising in restaurants and cafes. We have been told to temper our conversations at times or "none of us would ever eat out again' !!!! No hair with food, either facial or head please. For those who wanted to know what a beard net looks like, here is one with hair net too. I have to confess to thinking the Hairy Bikers look particularly unsavoury with the greasy hair and beards so would like to see them covered. I wouldn't really want them near my food..
OH has cooked for me for nearly 40 years: haven't found any unwanted hair yet. Well, they don't wear hair nets on the Bake Off type programmes either. I thought beard nets were compulsory in restaurants. Guess you can't insist on them in the home though. Just hope for the best. I always notice Mary Berry's false nails when she has her hands in the pastry mix. Wouldn't want to find one of those in my cake! I've seen them in use on the food factory programe. I can imagine her being spotlessly clean and particular. Jalima......it’s not Jeremy Corbyn is it?